Phacoemulsification cataract surgery is a procedure to remove cataracts, and this type of eye surgery has both pros and cons that you should know about before you make any final treatment decision. This is one of the most popular methods for cataract removal, and may be one step in refractive cataract surgery when a cataract is removed and an underlying vision problem is corrected at the same time. Perfect vision after cataract surgery is not always possible, but using the phacoemulsification method helps to reduce complications when compared to other methods. There are a number of benefits to having this type of surgery done, and the reviews received by this method are just as good or better than laser eye surgery reviews by patients. The incision made is extremely small, often only one eighth of an inch in size, because ultrasound waves are used to break up the cataract into much smaller pieces, which makes a larger incision unnecessary. A small surgical vacuum is used to remove the cataract pieces from your eye, and then it is irrigated and flushed to ensure no smaller pieces were missed and left in your eye. A folding lens implant also allows for an extremely small incision, and only one or two stitches are needed at the most once the lens implant has been placed. The recovery time for this procedure is between two and three weeks, and there is little or no bruising or evidence of trauma during recovery. This type of cataract surgery does have some cons to go along with the numerous benefits, and there are some risks and complications that need to be considered before you decide to have this procedure done. In some cases the lens implant may move, and another surgery may be required although this complication is rare. 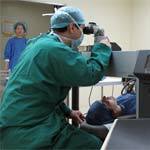 There is also no guarantee of perfect vision after cataract surgery, and a small percentage of patients may end up with blurred vision or a sensitivity to light, called photosensitivity, as well as other possible complications. Phacoemulsification cataract surgery does have a few drawbacks and complications, and it is not the right choice for everyone. When both the pros and cons are compared though, the benefits for most individuals with cataracts far outweigh the cons with this method.